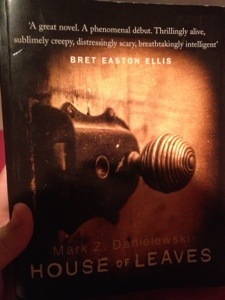 It’s a strange and scary book all related to an odd film and an old man’s studies of it before meeting his demise. I have never read any horror…and this is playing with my mind big time. I love it! Leeds went to Doncaster in the cup and won 3-1 which was amazing as it was what I predicted on my football predictor. Onto the next round then! This entry was posted in 2013, 365, Books, Football, Leeds United and tagged House Of Leaves, leeds united, lufc, Mark Z Danielewski. Bookmark the permalink.